We arrived in the Santa Ynez Valley on Friday in the Conestoga. The Santa Ynez Valley is just north of Santa Barbara in the Central California wine country, 230 miles South of the Western Outpost. We arrived early to drive the race route, in particular, to check out the corkscrew, a nearly vertical climb at about mile 7. 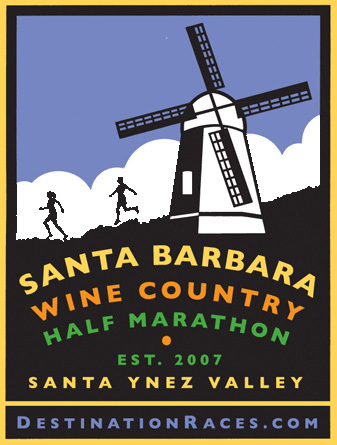 Our training for the Santa Barbara Wine Country Half Marathon started last week. 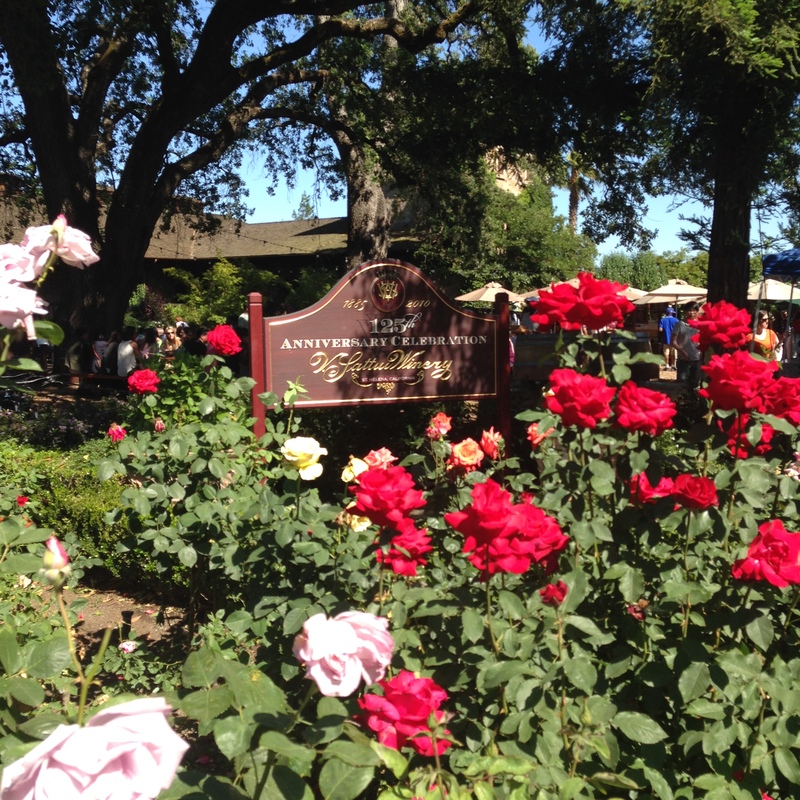 We headed north to Napa Valley to hit a couple of wineries, V. Sattui and Louis M. Martini. The route from Martini to Sattui was about 100 meters on a fairly flat surface. 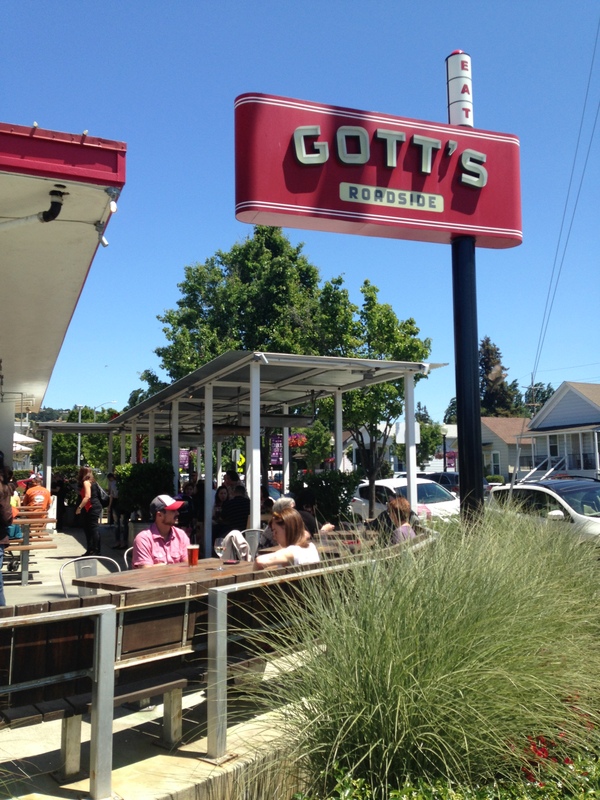 We hit the Gott’s Roadside to replenish our carbs. Training after Napa consisted of a 3 mile run on Tuesday and a 4 mile run on Thursday on the Guacamole Trail out back. The rest of the week was spent on the elliptical. We were not ready for Santa Barbara, and we were not even running a full Half. We signed up for the mixed team relay under the name Texas Strong. S was running the first leg, about 5.9 miles generally uphill and I took the second leg of 7.2 miles-generally downhill, but with a few hills to challenge the runners. A visit to Sideways country requires a stop at HP2 in Buellton. 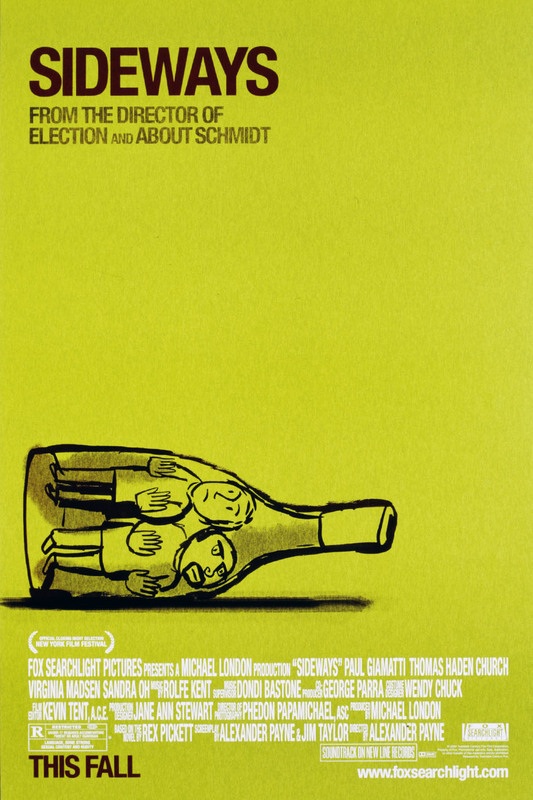 We had the Merlot. 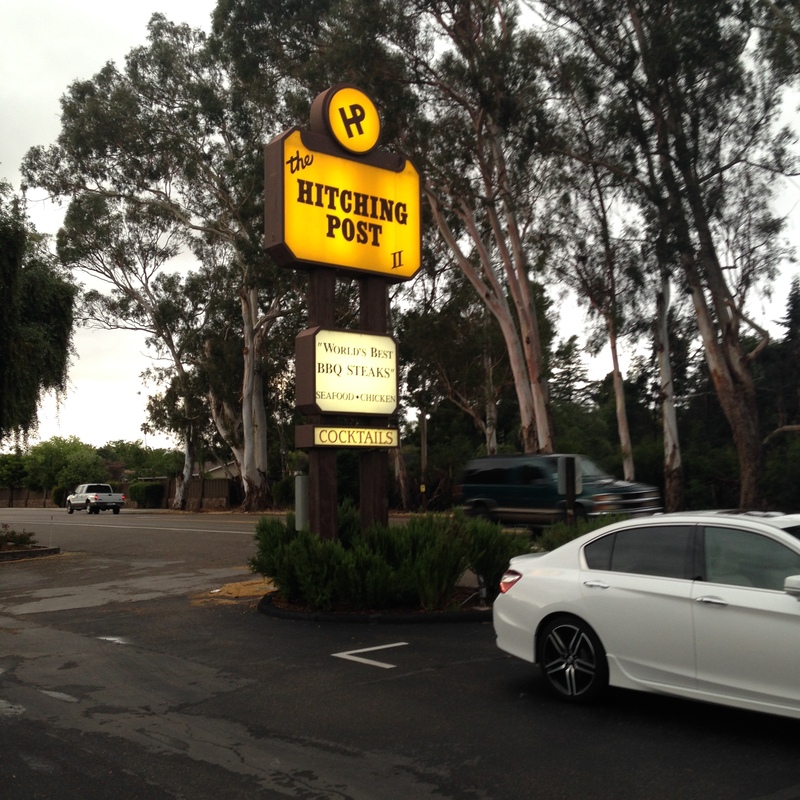 After dinner, we drove the race route, from Santa Ynez up to Los Olivos then down to Solvang. S acted as navigator as we snaked through the rolling back roads. We passed the transition point in Los Olivos, then headed toward the vertical climb shown on the elevation map. As we turned left, the road turned up at about an 8% grade. The sign warned that trucks were not recommended. Yet we pushed the Conestoga onward up the corkscrew, unable to turn around on the narrow, winding, steep road. We began to wonder if we had made a wrong turn, but then the tell-tale signs of a half marathon rest stop came into view at the top of the hill– a patch of gravel and a portable toilet. For the relay runners, the corkscrew was only 1 mile into our run. For the half marathoners, it comes 7 miles into their run. Race organizers can be evil. The weather on Saturday morning was overcast and about 60 degrees. 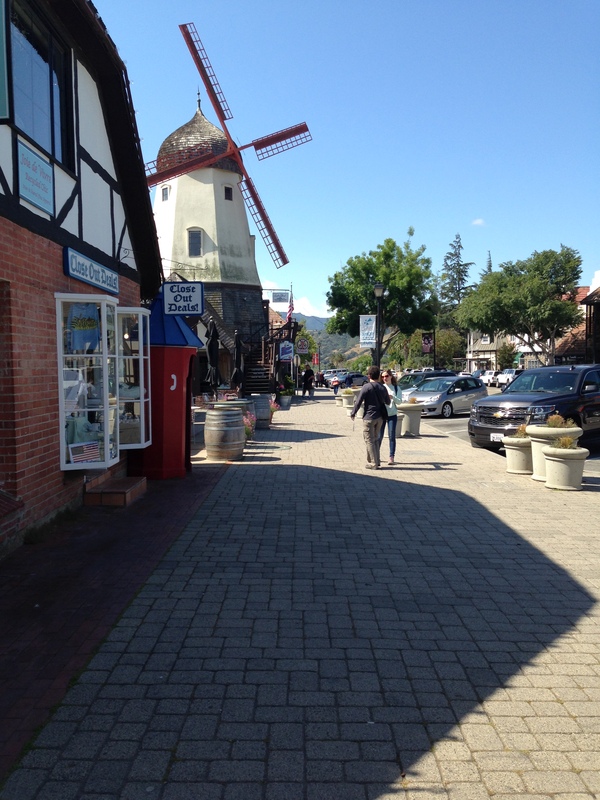 We parked the Conestoga at the finish in Solvang at 5:30 a.m., then took the shuttle bus to the start in Santa Ynez. As we waited in the local post office to keep warm, S in her Texas Longhorn running jacket, 4 women who were running the half, 2 who attended UT, 2 who attended Texas Tech, introduced themselves. To their chagrin, we mentioned the surprise that they faced at mile 7–and that our hilly run in Austin did not compare with what awaited them here (add evil laugh here). After the small talk, we headed to the start. 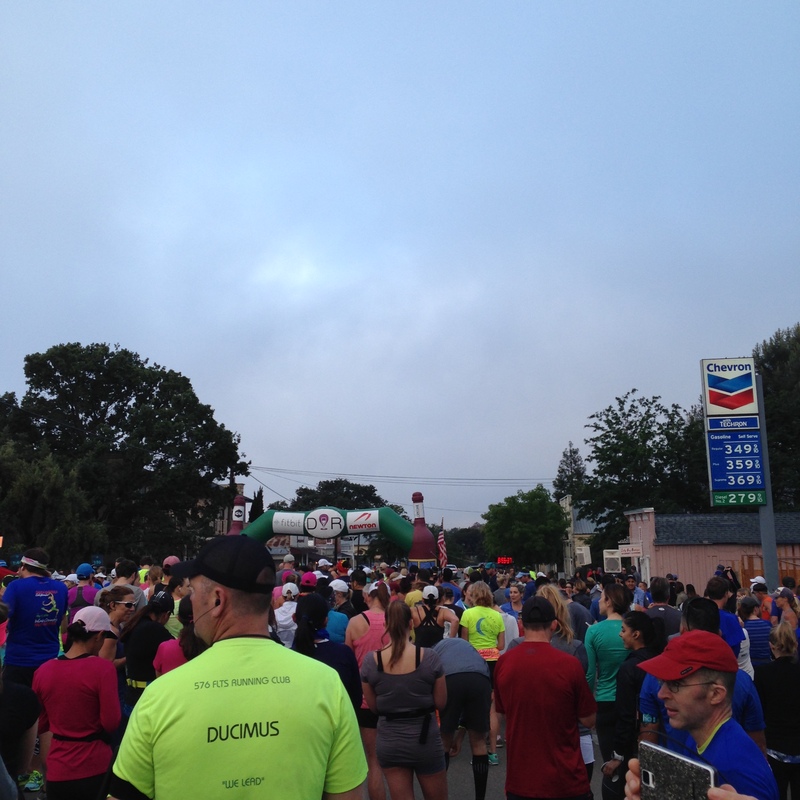 Once the race started at 7:05 a.m., S headed off running toward Los Olivos, and I took the shuttle bus to the transition point. The leader of the race was cheered through the transition in Los Olivos at 7:35 a.m. S arrived at 8:06 a.m. We talked about the pet turkey that a spectator had out. I took a picture of S with my iPhone. I started my playlist (a recycled Dallas RnR Half Marathon playlist), We high fived and I took off, looking forward to my encounter with the corkscrew. From a distance, one sees the looming hill, and what appear to be a line of colorful stick figure joggers and walkers zig-zagging up the face of it. I would estimate a good 50% of the runners walked up that hill. I jogged up, leaning slightly forward for some gravity assist, at the risk of falling forward and hitting the pavement. Once summiting, I grabbed some water and then let gravity take over as the route heads down fast. We were greeted by a herd of bison at the bottom of the hill. The race organizers managed to fit in 4 more fairly respectable hills to the end. I passed the 2:15 pacer at a near sprint at about mile 11. I crossed the finish line at 2:11 total time, for a 10:03 overall pace, good enough to place us 27/62 for the mixed relay teams. Had we not stopped and gabbed for 3 minutes at the transition, we probably would have had a sub-10 minute pace. We went back to the finish line to cheer on 2:30 pacer, a blogger at “Rather Be Runnin'”, then had a variety of wine at the Finish Line Wine Festival in Solvang. We stayed at the Flying Flags RV Park in Buellton Saturday night. It is a nice park in need of some serious help at the front counter. I posted a review at RV Parky several weeks ago about my problems getting a reservation. The very pleasant front counter clerk who was the subject of our RV Parky review was the same one who checked us in when we arrived. She put us in space 59 (after I convinced her we did not have a travel trailer, or a dog). When we arrived back at the RV Park Saturday evening after an afternoon celebrating at the Frass Canyon Winery, there was a Fiver in space 59, so we pulled into space 60. Sunday morning we had a note on the Conestoga telling us to check in at the front desk. The clerk (same one) said we should have been in space 31. Like I said, the clerk was very nice and very pleasant. Sadly, she does not know how to use the Flying Flags RV Park computer. We bought a wine rack at the RV Park gift shop. Really. This was the second Destination Race event we have run, the other one last fall north of Sonoma. This race organizer. though evil, knows how to put on a run. All of their races are in wine regions, California, Oregon, Washington, etc. If you are looking for a destination run, Google Destination Races. RV park hosts are always uber nice, not always computer literate. I email and follow-up call all reservations and cancellations. Amazing what doesn’t get through the system. I’m going to camp at Half Moon Bay state beach RV campground on May 18-20. Then go up to Redding to bass fish on 2 private lakes, courtesy of The Fly Shop in Redding. Camp at the lakes, have guides with driftboats, flyfish only. Should be interesting. This week getting 4 Koni shocks installed to reduce rough ride. It that doesn’t work, then will install air bags (like the Airstream Interstate). We’ll see!